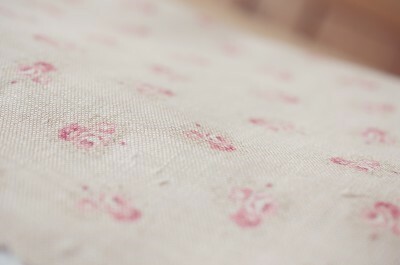 Peony and Sage fabrics are my absolute favourite! It’s no secret that I love all things pretty! My home has touches of faded florals, modern country, shabby chic and French vintage inspired furniture. When I created the branding for Sweet Ally Scoops, I was definite that I should extend my loves and styles into my business and my van. 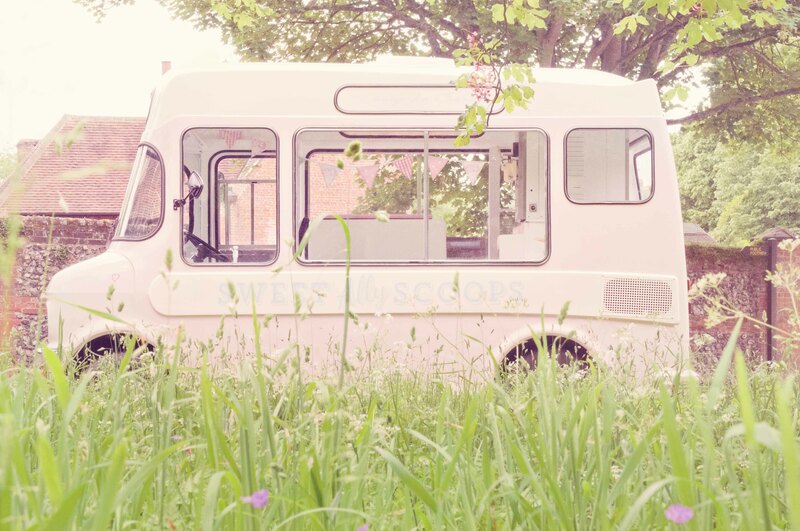 My colour choice for the van of soft shell pink and vintage white was easy as soft pretty pink has always been my favourite colour. Next step was choosing the style of accessories to match the overall look I wanted to achieve. My first thought was of course the exceptionally talented fabric designer Kimberley Bell, creator of Peony and Sage Fabrics. I have swooned over her fabrics for a long time. Take a look at her website and you will be hooked! I nervously sent her an email introducing myself and Sweet Ally Scoops and my wish to adorn my van with her fabrics. I heard back from Kimberley straight away and she loved my ideas! She even created a mood board for me on Pinterest! Helped by her love of ice cream I think! Kimberley’s fabrics compliment my van perfectly and the only difficulty I had was trying to choose which Peony and Sage fabrics I would use. Kimberley then introduced me to Claire, owner of Clarabelle Interiors. Claire helped me choose the right Peony and Sage designs to match my branding and then she made me the most exquisite bunting and lavender hearts. 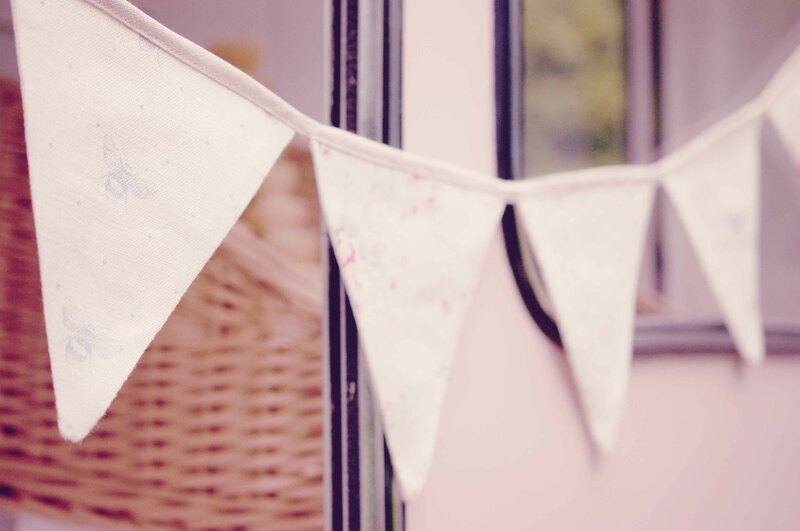 Claire has even made me some mini bunting which I use to adorn the chalkboard on my vintage ladders displaying my ice cream flavours. Claire’s sewing talent is amazing and she is such a lovely lady too. The quality of the linen is divine and adds such a special touch. I have one of the lavender hearts hanging from my rear view mirror and I just love the smell that fills the air as I am driving along to a wedding or event. As an extra touch, my driver’s seat is also upholstered with Peony and Sage Just Bee’s linen. Kimberley so kindly sent me some Millie fabric for Claire to make into a tablecloth for me. I save it to use at weddings on the table beside my van, complete with fresh flowers and my little heart tokens. Of course my home has gradually seen the appearance of Kimberley’s fabrics! I was so lucky to receive a beautiful eiderdown for my birthday and I also have bedroom curtains in plain laundered linen and living room curtains in “Millie”. Kimberley and Claire are both beautiful inside and out. They are so supportive of my business and it is such dream come true to know such inspirational people. I hope to share a cuppa and a waffle cone with them both one day soon. I wonder which of my Gelato flavours they would choose?! 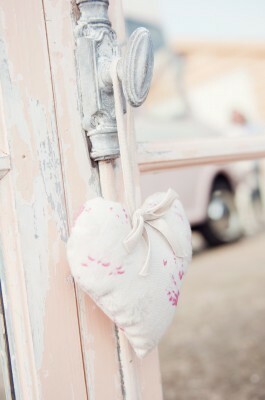 My favourite P&S design: Just Bee’s in Blush Pink of course!